EmmiYogurt – made in the Swiss-tradition, with real fruits … what a concept! In addition to all of the above, with was live gifts - it's SO much fun! - guests also received a package of GoGo squeeZ Apple Mango Sauce (try it on-the-go and you may not want to share with your kids), Nautica black polo shirts (for those casual trips on the yacht), Wicked is Better burned-out t-shirts, & free classes to The Cell Collective. 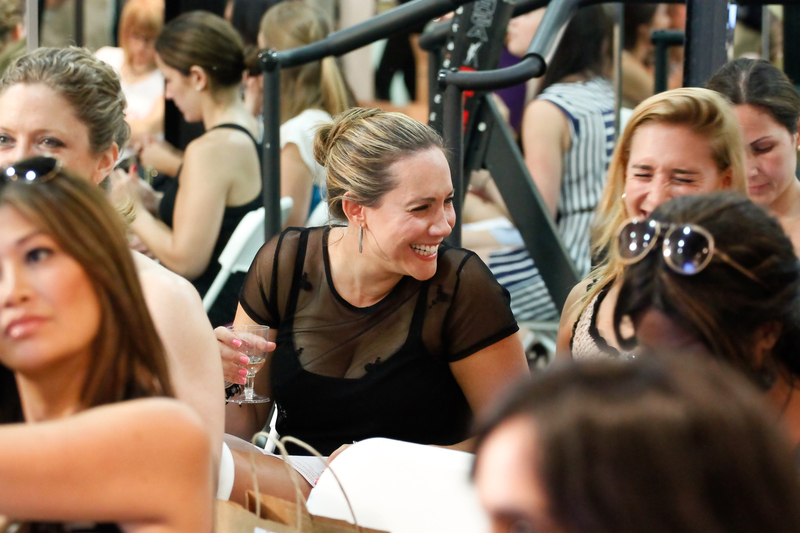 During the party, guests indulged in luxurious massages and makeup touchups courtesy of the team from Oasis Day Spa. The Emmi Swiss Yogurt Bar had an assortment of yogurt flavors and healthy toppings. 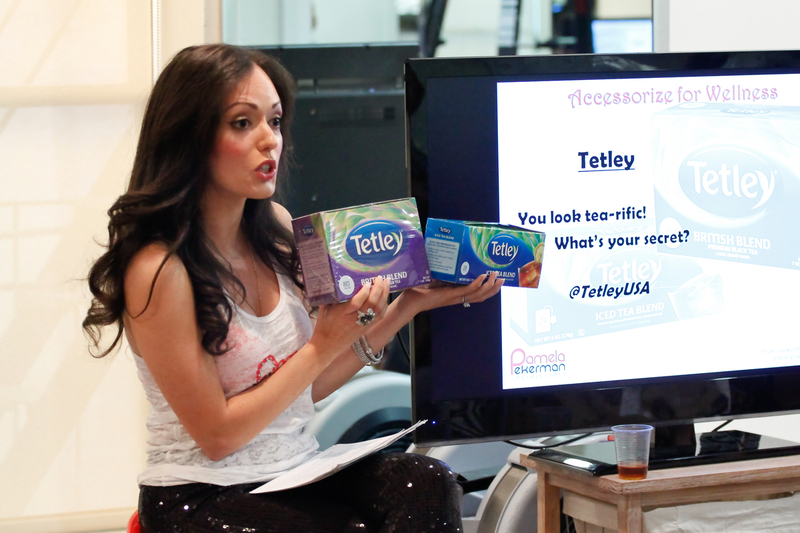 Thirst was quenched with Tetley Tea USA’s variety of iced tea and hot tea. CellarAngels.com, an online wine retailer that links small, family-run vineyards from the Napa and Sonoma valleys and donates 10% of sales to charity, provided wine. I'm also was pleased to announce that thanks to the generosity of the participating brands at Accessorize for Wellness, $2,500 was donated to the Ilya Peckerman Fund Vasculitis Foundation, which raises money to fund research grants to find the cause and cure of Vasculitis-related diseases. It's in honor of my late father, so if you're in a generous mood CLICK HERE. It's been a hectic and exciting month, as we gear up for the next Accessorize influencer party. This time, the theme is health and wellness. On June 20th, I'll share my favorite accents to keep you fit, fabulous and fierce. 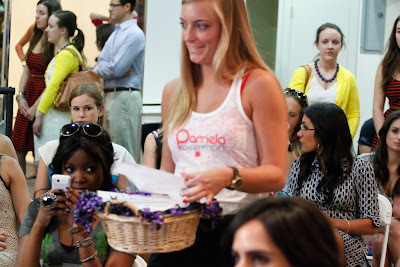 Don't forget to follow me and my gals on twitter (@PamelaPekerman @TeamPamPekerman) as we entertain 35 ladies including ABC The Chew's Carla Hall, TODAY Show Correspondent Jene Luciani, former NY Housewife and gifted textile designer Alex McCord, Cheap Chic Shopping founder Jess Zaino, and editors from SHAPE, HEALTH, LUCKY, FashionIndie.com,StyledOn.com and more. As always, I save an extra gift bag just for you! 1. Twitpic a product/food/clothing/place that makes you feel fit, fabulous and fierce. Images must include hashtag #P2Accessorize4Wellness, and phrase "This is how I stay fit/fabulous/fierce @PamelaPekerman"
Fit. Fierce. Fabulous. Are you ready to win big and have a healthy, happy summer? Only images posted from June 13 - June 21, 2012 are applicable. Contest ends June 21, 2012 12pm PST. We'll pick our favorite twitpic and announce the winner on June 23, 2012. The weather has been quite unpredictable in New York, this week. Here’s a layered look I chose for lunch with scarf designer Bindya Lulla. Brian Atwood Maniac pumps in black patent ($580)– comfort is their middle name! PS It's Handbag Humpday. Tweet me your bag of the day @PamelaPekerman #HandbagHumpday and I'll RT my favorites.